Venturing across the world boils down to one important aspect and that is to stay organized. Traveling can be a hassle not only with choosing your hotel and flight options, but with the actual packing and getting to where you are headed. We like to have a checklist that we always refer to when we are packing just to make sure we have all of the essentials and we always make note of what we can do to make the overall experience a lot less stressful the next time. In order to help you destress, we have compiled a list that made our 2018 travels worth while so take these into account when you’re planning you next holiday. We hope this helps! It’s here, it’s brand new, and it’s awesome! GoPro has really raised the bar when it comes to video stabilization from a small handheld or mounted action camera. Last years HERO 6 did a pretty good job but could only shoot stabilized video at 30fps and could still be shaky at times. Now, the new HERO 7 allows video to be shot in 4k at 60fps with the new ‘Hypersmooth’ electronic image stabilization setting active. If you don’t believe us go check out the now hundreds of reviews between different cameras and the HERO 7 to see the proof! 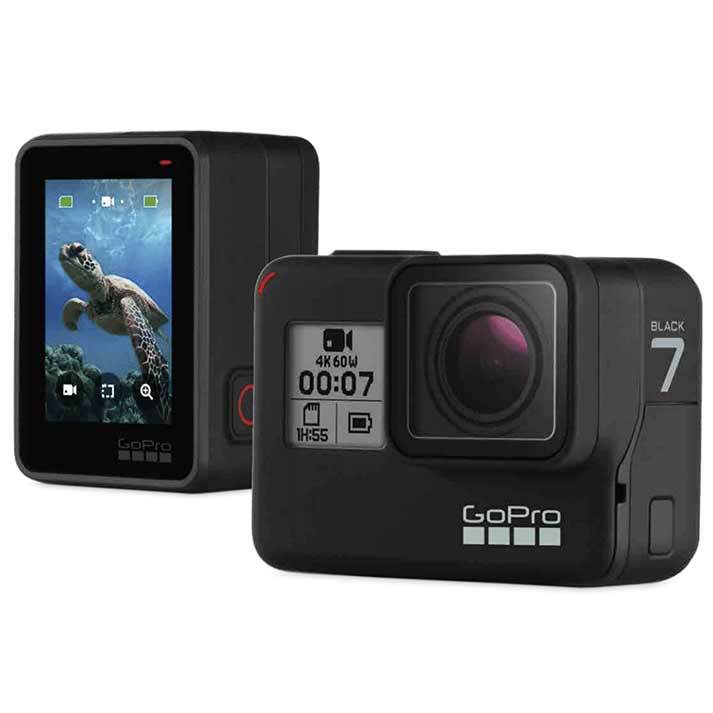 Waterproof, 4k, stabilized video and can be mounted to almost anything…what more could you ask for in a camera that fits in your pocket? Our first organizational essential would be our traveling passport wallet mainly because it helps us keep track of all of the essential items in the same vicinity, which is important for trips to the airport. It does all the functions of a normal wallet, holds credit cards, ID, cash and coins but then it takes it a step further with slits to hold your boarding pass, passport, phone, extra sim card and more. It also has an RFID blocking shield so wireless theft is eliminated with this super hi-tech wallet. We absolutely love using this wallet for trips abroad because the airport can be a bit frantic from check-in to boarding time. Instead of holding your passport with you at all times during your trip, opt for keeping a copy of your passport handy or a picture on your phone in need of emergencies. Remember, it really is your lifeline! Now this would be for the adventurer that either is always without power outlets or the traveler who just forgets to use them. Either way mistakes happen even when you’re so far out in the wilderness and an extra charge is always nice. External batteries come in many designs with different features. For the one always out in the wilderness look features such as rechargeable with solar energy, shock/water/dust resistant, flashlight, compass, multiple outlets but most importantly if its needed for long periods of time look for the one with the biggest power bank for the least amount of weight. This can be key for when your pack is getting heavy. As for the other adventure, again consider the weight and storage of the charger as well as number of ports and charging options! This inflatable pillow was mainly designed for the backpacking/camping lovers but there are several reasons as to why you should buy this. One: those long layovers at the airport will be a little bit less unbearable if you carry along with you this blow up pillow. Two: If your staying at a hostel and you don’t fancy using pillow there this will save you. Three: when going on a road trip, bringing this will save you room. If you’re a just in case type of person than this will always be your friend! We own these and use these daily and we can easily say that these headphones are the best ones we have ever used. You can talk on the phone with them and blast music without hearing a peep from the outside noise. Yes when it comes to planes, you need to have plug in headphones to hear the built in but for the everyday wear these are your best bet. Plus you can sweat like crazy in these and nothing will happen. Especially when you’re traveling on a plane during a red eye flight or waiting in the airport that has no wifi wherever you are in the world, this will be your best friend for those who love books. This Amazon Kindle is probably the best deal that has come out to date. If you’re not much of a book reader, then you can listen to books or podcasts on here as well. This device will not only help you expand your knowledge and imagination, but will help lighten the load by replacing the books you were going to bring along with. This is one of my favorite gifts since I am a true coffee lover. Just imagine having hot, fresh espresso with you on the go! Better than having to find a Starbucks or local coffee shop while you’re out and about. This is especially great for when your camping or hiking when you need that extra boost to get you up after a funky sleep on the ground. Honestly, this gift speaks for itself and there’s no need to convince you that this is a cool gift for your loved one! Drones have been increasing in popularity recently and we wanted to add this option for those travelers who want to start a YouTube channel or IGTV with their own vlogs. Why not get the bird’s eye view of every place you go with this amazing drone to go to that next level of travel documenting. Here we gave you two options because we recommend giving the practice drone a try first to make sure you have the flying basics down before you start shooting video on the larger, more powerful drone. Purify your water when you go camping. Just do it. It doesn’t give you a trail cred that you sip straight from the river and even if it does it will go away when you have Giardia for a week and can’t trek because of the constant diarrhea. So yes, treat your water. This also goes for those trips to countries where the water isn’t the best to drink! When it comes to organizing our suitcase for a trip we have it pretty down packed, literally. Any experienced traveler knows that rolling is the best method to not only maximize the amount of clothes you can bring but it can keep everything organized as well if done correctly. When it comes to the cubes there are so many different brands on the market and we just went with the one on amazon with the best and most reviews but they all look similar. Shacke is great because of the flexible material that it’s made of. Let us know if you like these types of blogs from us and we will create more like these so that you get enough ideas on what to buy your world traveling family member or friend!! Email us at Support@YourVitalVentures.com!! *Disclaimer* – These are affiliate links that help fund the operation of this website! Every purchase is much appreciated!! !